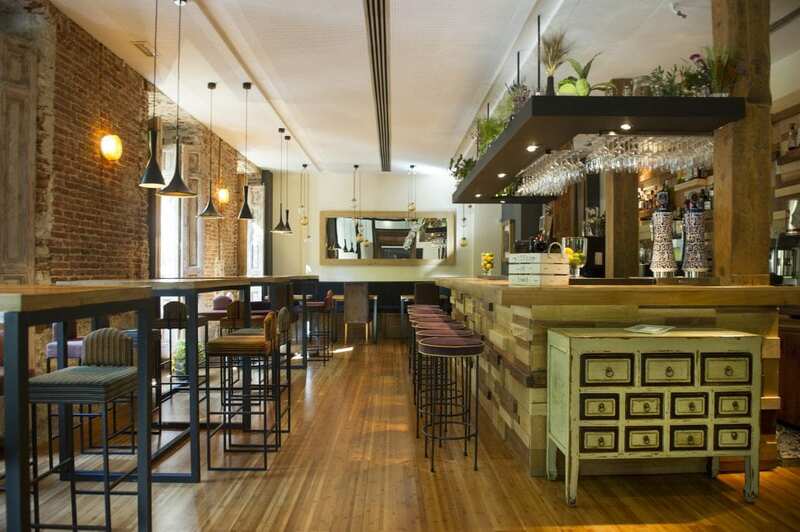 The more I know great Galician Restaurants in Madrid like Lúa, the more I am planning my next vacation in this gourmet land in the north of Spain. Lúa is not the latest glamourous restaurant launched three weeks ago, it’s an institution both in Madrid and around the world. What’s the strength of this restaurant? For sure the degustation menu formula is something that is very characteristic about this place. I think we should also ask for suggestions when we visit a new restaurant and I guess a seasonal tailor made menu by the chef is the greatest advice you could ever receive. 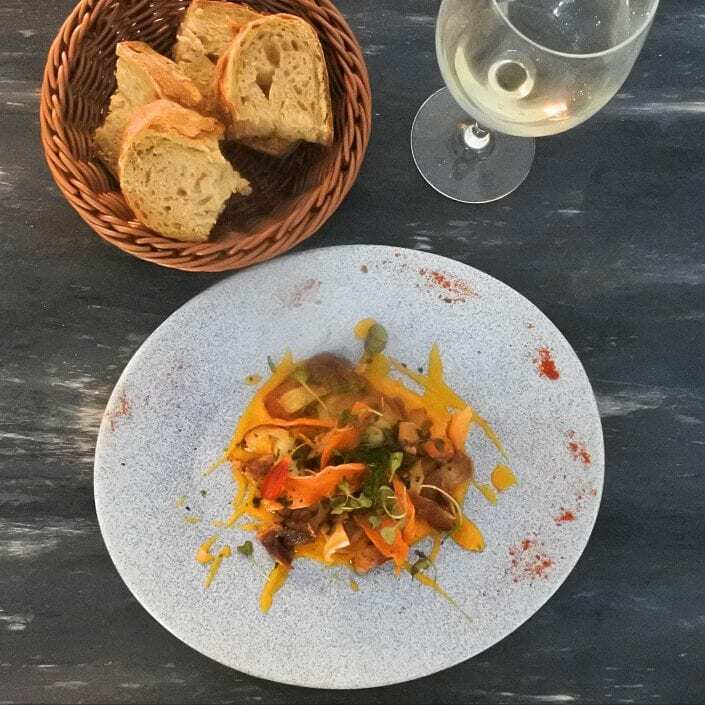 Cocina Gallega 100%, from the ingredients, to the name of the restaurant, Lúa means moon in Gallego, and have been dreamed and realized by chef Manuel Dominguez from more than a decade. 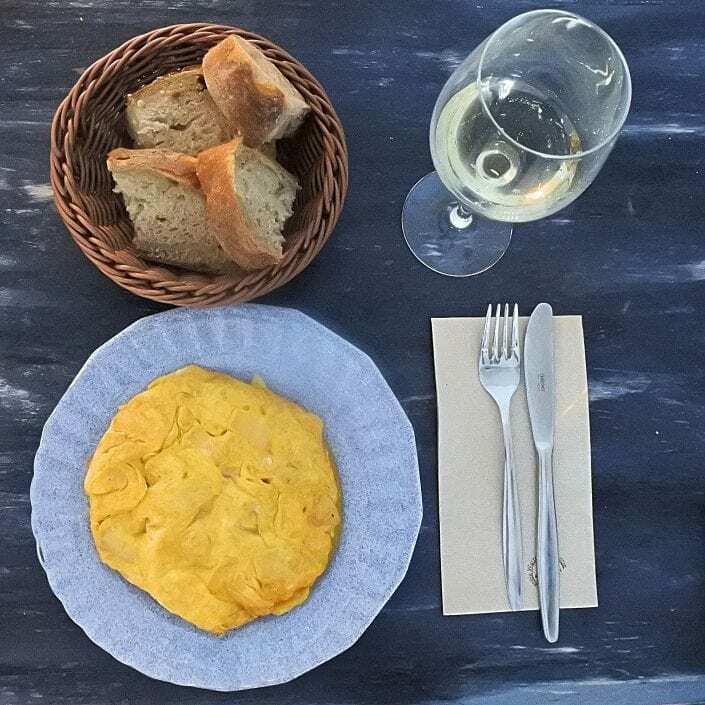 The restaurant became popular in its first location, a tiny space in calle Zurbano, which was specifically thought for the degustation menu, kept the same formula when moving to Paseo Edoardo Dato. A renovation of the restaurant in 2015 opened a new perspective with the typical Spanish barra, ideal for happy hours or afterwork. Everyone can try exquisite menu dishes in singular raciones, enjoying a starred tapa without reserving for a menu. So far so good, Lúa Restaurant can spend its name as the only Galician restaurant outside Galicia than has received a Michelin star, and can also count on dos Repsol suns and two M by Metropoli. I heard that Manuel Dominguez Pulpo a la Galiciana (el clásico à feira) is the most authentic in Madrid, and I have to say that I totally agree especially because of the typical presentation, the octopus in its simplest form. A dish that it’s typical from Galicia, but that it’s also so hard to cook and to find such in perfect texture like in Lúa. This classic version is one of the dishes you can try also at the barra in Lúa. Another tapa that you can’t miss at Lúa’s barra is the bocado de foie micuit on a pear and queso San Simon empanada. Tremendously good. From the amazing decoration of the space, to the art of designing a menu based on seasonal and market products from Galicia, every detail matter. I have also appreciate the detail of the wine, with more than 150 different labels you can also try a Galician wine produced only for the restaurant, they have their own label, with a white and a red Ribeiro elaborated with the variety coming from the autochtones artesanal. 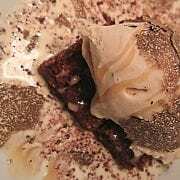 Un buen plan para terminar un lunes: brownie con helado de almendras y trufa negra, solo en @restaurante_lua 🍫 #madridiana. A special detail I really suggest to try, because as it happen to me, you will rarely forget from this restaurant, is the end the meal with the truffle brownie, which doesn’t me truffle chocolate, but real black truffle layers and mixing flavours with a almond ice cream and a chocolate brownie. Last but not least, two spaces of the restaurant thatntotally deserve the right attention. First, you can reserve a big space downstairs at the entrance of the restaurant, with a special menu, which is perfect for example for business dinners, high demanded as I could see by businessmen travelling from the all over the world, reserving with months and weeks of advance. The second space that is accessible in two different ways, from the kitchen (yes, walking through the kitchen) and from a special entrance, it’s a private space for special occasion. When I saw it my mind hasn’t stop thinking for which occasion a could reserve it, and I am still wondering how I’ll be able to try this experience. Madridiana is the goddess of hunting cool places, when she meets another goddess they will be friends forever. Morgana is a strong woman, a Celtic goddess, una mujer de fuerza. Madridiana met Morgana on a sunny Sunday morning, while she was hunting new places in the very center of Madrid, the barrio Chueca. 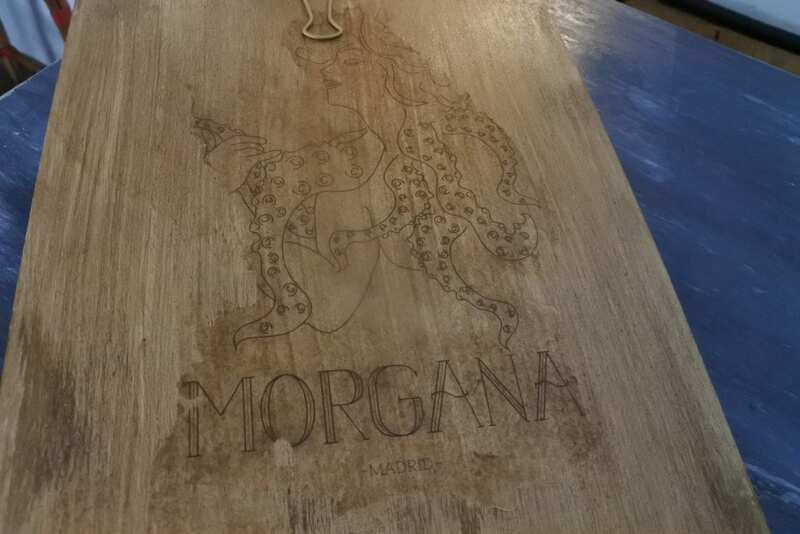 Morgana immediately appear to be for the naming, the atmosphere and the Galician origin of the founders, as a big deal, a recently opened restaurant with a brand new unique offer. The answer is simple, as Augusto and Miguel, the two owners, immediately explained that they wanted to have a strong identity, that’s why they chose a woman, and a powerful message, that’s why they chose a mitologic figure. Augusto and Miguel are the two owners of restaurante Morgana Madrid, they are really young but at the same time they have gained a lot of experience around the world. Their competences complete each other because Augusto has studied and worked in hostelry while Miguel is the chef. This special mix of skills has on the other side the most important thing in common: friendship. They are good friends and they both come from La Coruña. So two common features: friendship and roots. Their provenience need to be explained a bit because it’s because of their Galician roots that they have started the Morgana adventure. Galician water, beer, food and tradition and ingredients. They are focused on spreading the Galician food best products in Madrid, modernizing the most famous traditional food with a touch of international cuisine, because Miguel, the chef, has travelled a lot, in Europe and outside. The ceviche is for sure the result of his Peruvian experience. Not to mention that he has also worked at Diverxo with the awarded chef David Munoz. Galician traditional best sellers as new, more contemporary, reinterpretation. I will write about my experience, which will be personal as always and “non replicabile” because every week Morgana changes the menu. 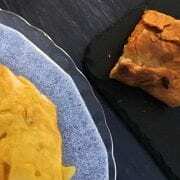 The best food for sharing like the tortilla, the croquetas and the empanadas are the only fixed food of the menu, but especially for croquetas and empanadas the flavors usually change as well. What attracted my attention was the scallop plate with pork and a pumpkin creme, impossible to resist. What I really loved about this plate, above the taste of course, was its concept, Miguel explained me how he balanced the fat savor of the pork with the acidity of the pumpkin creme. Everything from a simple burrata to a more complex dish, is expressed in a new custom version edited and invented by Miguel. 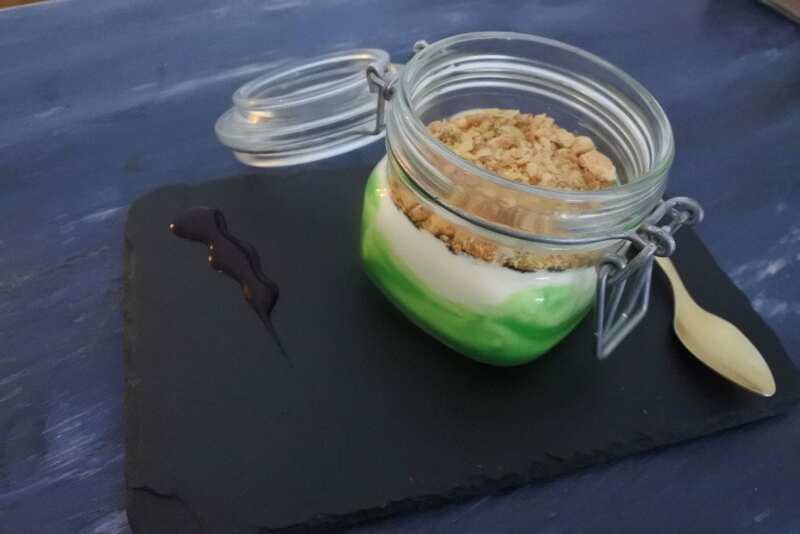 Even the dessert I ‘ve tried had a twist of unconventional, with the crunchy texture of the bizcocho and the sweet cheese cake cream.